Pre heat oven to 375F. Mix together 2 1/2 cups flour, 2 teaspoon baking powder, and a dash of salt set a side. 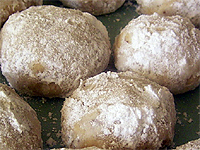 Beat 1 stick of butter(soft), 1 cup of sugar, 2 eggs and 1 teaspoon lemon extract and a zest of a lemon.Mix 1/2 of the flour mixture and 1/4 cup of evaporated milk(cooking milk) Mix well and add the other 1/2 of the flour mixture.Place the dough in the refrigerate till firm.Roll 1 tablespoon of the dough into a ball. And dip into bowl of 1/3 cup of sugar. Place on an ungreased cookie sheet and slightly flatten with the bottom of a glass. Bake for 15 minutes and remove form the oven and cool.